It’s flat, pretty bare country coming into Longreach. It’s so lonely a stretch of road that I wondered what it would be like driving along here at night. The word “dark” wouldn’t come close to describing it and the only light would be the brilliance of the stars overhead. Would we be able to see the lights of the town in the distance or would it be one of those places that sort of creep up on you? If you’ve ever dreamt of visiting Australia’s heartland, Longreach is a great place to start. 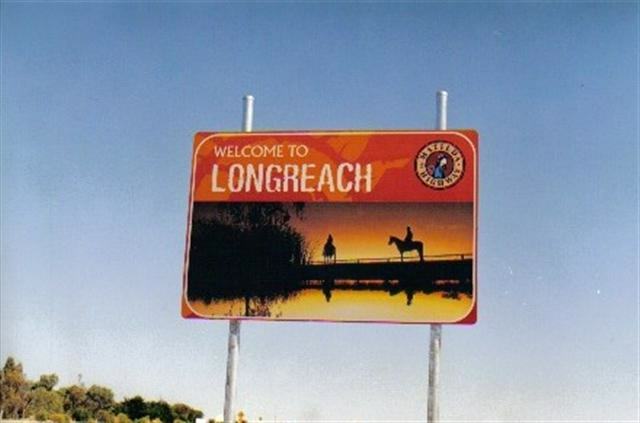 Proud to be the Custodian of Australian Heritage and known as the Gateway to the Outback, Longreach’s history dates back to the late 1800’s when a railway terminus was established. Following the completion of the rail link in 1892 the growth of the town accelerated and today the Regional Council covers an area of 40,638 square kilometres (15690 square miles) and has a population of 4700. 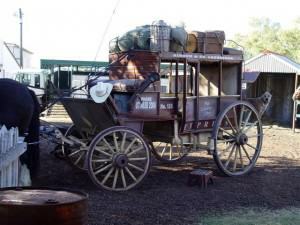 Approximately 1200 kilometres (746 miles) from Brisbane by road, Longreach has a multitude of things to do and attractions that showcase our heritage. Captain Starlight, one notorious bushranger! We checked into the Discovery Holiday Park ([star][star][star][star]) on Thrush Road and after lunch set out to explore Starlight’s Lookout. The notorious bushranger Captain Starlight was rumoured to have had his hideout in these parts back in the 1800’s. There are countless stories about him and there is no way to tell now where the truth ends and legend begins. 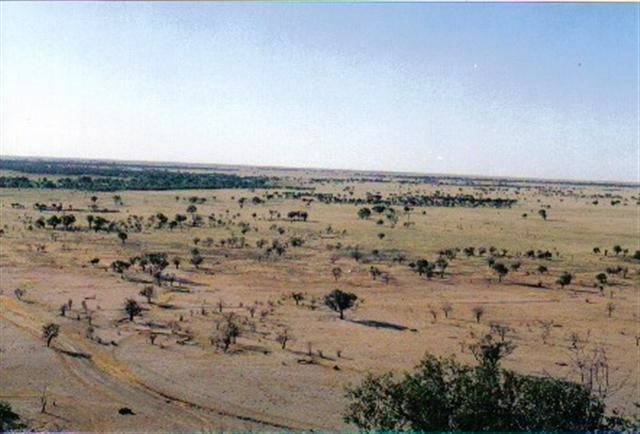 Suffice to say Starlight was quite famous as Longreach’s infamous cattle duffer (rustler) and his lookout was on the top of a hill, the only hill on an otherwise flat landscape, about 56 kilometres (35 miles) from present day Longreach. From the top you can see forever and, as the stories go, he could see the troopers coming long before they even got close. Starlight’s Lookout is worth the trek! certainly worth it. 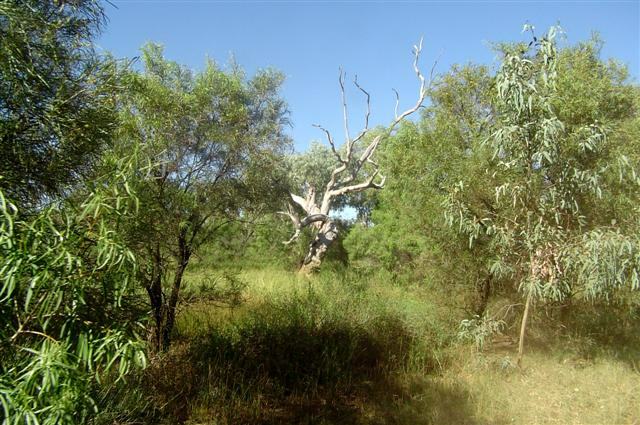 Captain Starlight’s real name was Harry Readford and he became part of outback folklore in 1870 when, with two other men, he set out from ‘Bowen Downs Station’, a pastoral lease in this area, with approximately 1000 head of stolen cattle. They drove the cattle through mostly unexplored country into South Australia. On his return to the east he faced charges of cattle stealing but at his trial the jury, obviously charmed by the man, returned a verdict of not guilty, thus ending one of the most daring escapades of the time. It was just on dusk when we returned to camp and settled in for our first night bubbly with our bottle of Two Tails Sparkling Wine. The evening was quite pleasant and we sat outside for a while before a cool breeze sprang up and chased us indoors. This was our second visit to Longreach, having been here some 6 years previously when we were in our tenting phase. A few drops of rain had started to fall and I was glad we weren’t tenting now! what promised to be an awesome day. This was not our first time at the museum and, most certainly, it won’t be our last. A lot of new exhibits have been added since our last visit and we were definitely going to see them all, from the Boeing 747 in the front parking lot to the photographic gallery in the Jo Shannon Discovery Centre. QANTAS, the airline, was founded by Hudson Fysh, Paul McGinness, and Fergus McMaster in 1920 in Winton and moved to Longreach in 1921. The first air services between Charleville and Cloncurry in Queensland began in 1922. In those early years they ran with only 2 aircraft and at that stage they weren’t carrying passengers; it was strictly mail and the odd bit of freight. Things have certainly changed over the last 90-odd years. 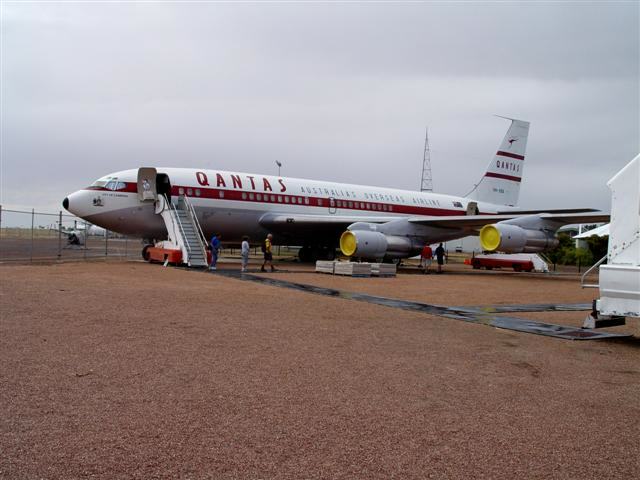 The original Qantas hangar is now part of the museum and is heritage listed; it is a fascinating reminder that Qantas is the only airline to manufacture its own aircraft. 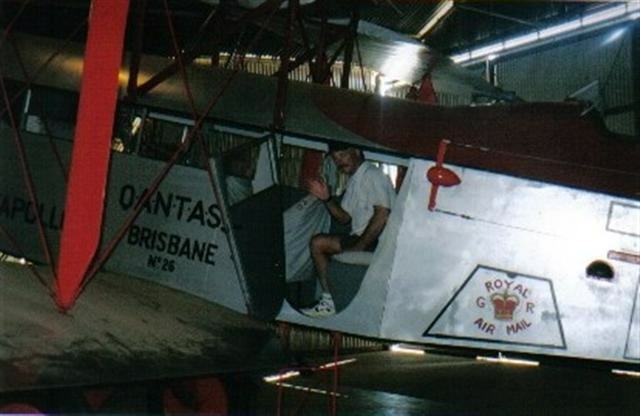 The museum contains a full-sized replica of the AVRO 504K bi-plane, the first Qantas aircraft as well as historic memorabilia and photographs. Inside the museum proper there are some models, perfect replicas in fact, of early Qantas planes and they are suspended from the ceiling on a revolving carriageway. They include an Armstrong Whitworth FK8, a De Havilland DH50, and a De Havilland DH86. The 747 is, of course, the major draw. Parked out front, that distinctive red kangaroo tail dominates the skyline. The jet, “City of Bunbury” is a Boeing 747-200 and touring this behemoth of the skies would definitely be the highlight of my visit here. Where else in the world can you tour a fully equipped, operational 747 jumbo jet? And, of course, there’s nowhere else in the world where you get to share the parking lot with a 747. I would love to have seen that reverse park! Our boarding passes were the tickets we’d purchased for the tour and a group of about 25 people were assembled for the start. It was absolutely fascinating; we were shown everything from the engines to the flight deck. Even the controls were explained to us. There is another tour, the Wing Walk Tour where a small group of 4 or 5 people is taken out onto the wing of the jumbo. It includes a visit to the navigational computer bay and you even get to sit in the captain’s seat in the cockpit. Unfortunately this tour was booked out and not just for this day but for some days ahead. I can understand that. Parked right beside the jumbo now is the very first passenger jet that QANTAS ever owned, the very first one sold outside the USA. 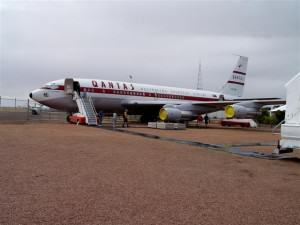 The Boeing 707-138 “City of Canberra”, only recently arrived at the museum, was discovered at an aircraft graveyard in England and lovingly restored by a team of volunteers. I remember my parents taking us to see it when it first arrived in Sydney back in 1959; the crowds were phenomenal and I never imagined that I would one day be standing aboard this legendary craft. 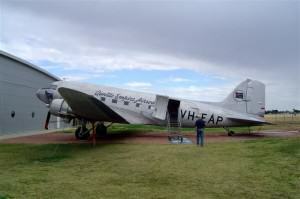 Outside on the lawns sits an original Qantas DC3, circa 1942 and we went aboard for a look around. There was no guided tour with this one for a couple of reasons. The plane is quite small; no way would 25 people and a guide fit inside this one, the cabin was totally gutted with only the cockpit still mainly intact, and, as any connoisseur of late-night movies can tell you, on the ground, the nose of the aircraft is at a steep incline. It was a struggle to climb up to the cockpit. 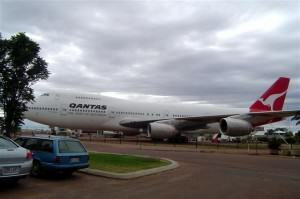 Still, she was quite a sight and looks every bit as good as when she was flown by “Qantas Empire Airways”. landing of the 747 at Longreach. The runway at Longreach airport is not very long and we learned that the pilot had attempted to land the jumbo, on the flight simulator, many many times and each time he had crashed the plane and so the actual landing was an amazing feat. The whole town turned out to watch. Next year the museum hopes to take delivery of a Lockheed Constellation; now that should be fascinating. The Jo Shannon Discovery Centre houses a spectacular photographic gallery. Some of the most exciting photographs of the Australian landscape that we’d ever seen were in this gallery. There were also a number of photographs of various Qantas aircraft through the years and these were on loan from the estate of a former senior Captain, a man who had flown every plane in the fleet and had attained the position of Chief Pilot. After our tours of the museum, the galleries, and the aircraft, some lunch in McGinness’ Restaurant, and some time in the gift shop, before we knew it, the day was over. It’s very easy to spend a whole day there. We’ll be back, we hope, many more times. 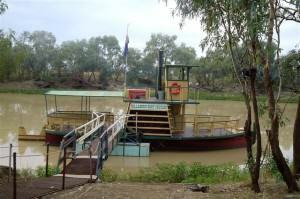 tour aboard the Thomson Belle on the Billabong Boat Cruises Sunset and Stars Dinner Cruise. The Thomson Belle is an old style paddle wheeler cruising the Thomson River. This was our second time aboard, having cruised here on our previous visit but nothing had changed. Norm Salisbury, the owner and operator, is still the same ebullient and gregarious fellow he’s always been and his crew were great. I was looking forward to seeing the sunset over the river and to enjoying the Drovers style meal around the campfire later but unfortunately we had no control over the weather. The overcast put paid to the sunset and the same could be said for the stars. It was a little disappointing to say the least. But we cruised along this magical expanse of water in the outback, sipping white wine and nibbling on cheese and crackers, and generally enjoying the company of our fellow travellers. Dinner around the campfire was especially good although Norm continually joked about what was actually in the stew. There were several foreign tourists among the passengers and they were looking distinctly worried as the meal was served! genuine Aussie folk songs and we all sang along with him. The boat skipper, Graham, also sang a few songs, but by far the best was Milton the bush poet. He had us rolling in the dust with laughter but his poem “The Wrong Way Down Memory Lane”, about his Dad’s battle with dementia, reduced more than a few of us to tears. It was a terrific evening in spite of the cloud cover. We had a very pleasant cruise down the Thomson River, a meal that Norm said was edible and the rest of us thought was great, and brilliant entertainment. It was a night we’ll long remember. 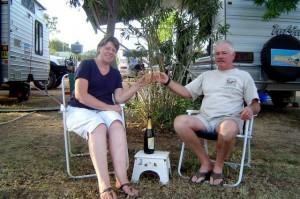 Our plans for the next day had been made long before we arrived in Longreach. After a leisurely morning we wended our way to the Australian Stockman’s Hall of Fame, a brilliant tribute to the men and women of the Outback. It was the brainchild of the legendary RM Williams and the late Hugh Sawrey, two men who shared a dream of preserving this country’s rural heritage. The Hall of Fame houses displays showing traditional artefacts, thousands of historical photographs, and audiovisual and interactive displays, all of it blended with stories of the outback and its people. The story begins with the Aboriginal people about 40,000 years ago and takes us through the British settlement and colonisation, right up to today, the 21stcentury. It celebrates the stockman from those early days on horseback to mustering cattle with helicopters, from travelling the countryside in a Cobb & Co coach, to four-wheel-drive transport, and the explorers who mapped this vast land on foot over weeks, months, and even years, to today’s satellite technology. The Australian stockman was born in those early days and has developed into a distinctiveness that sets him apart from the American cowboy and the Mexican gaucho and makes him a unique part of our heritage. We wandered through the many displays, all the time learning more about this great country of ours. We saw the Furphy, which I believe was a water tank on wheels, an absolute necessity in the harsh, hot, dry outback. Water is the most precious of resources and the single most important commodity in the outback. It had to be transported to properties until they could tap the bore water that lies under the plains. The Aboriginal people had, of course, been doing this since time immemorial but the white man had to learn and many of them perished in their efforts. So much history for such a young country! 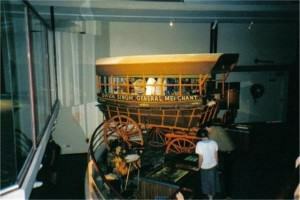 The Hall of Fame also has on display a fully restored Peddlers Cart. Merchants would travel from town to town, property to property, selling their wares from these carts and their arrival was usually greeted with a lot of excitement. They didn’t exactly have a department store just down the road in those days! In the early years there were more sheep than cattle in the outback, in fact sheep first came to Australia with the First Fleet in 1788 and it has been said that Australia was built on the sheep’s back. The Hall of Fame has a magnificent display depicting sheep farming here and is well worth your time to have a look at it. For over 3½ hours we strolled through the galleries and then stopped for a late lunch in the cafeteria before heading back to camp armed with the knowledge that of all we learned today about Australia, we still have much to learn. And after a long day like this one a quiet evening was just what we needed and we settled in for an early night knowing that tomorrow would be another busy day. But the caravan park was hosting a sausage sizzle, the bar was open, and there was entertainment to boot so our early night was not as early as planned. We had a fantastic time and thoroughly enjoyed ourselves. By about 9:00 though it was getting too cold to sit outside and, like many of those present, we called it a night. Longreach is what you think a country town should be and the Station Store of Kinnon & Co is one of those places straight out of a western movie. From boots and a wide variety of leather goods to shirts, hats, and jeans, if you want to look the part, this is the place to come. 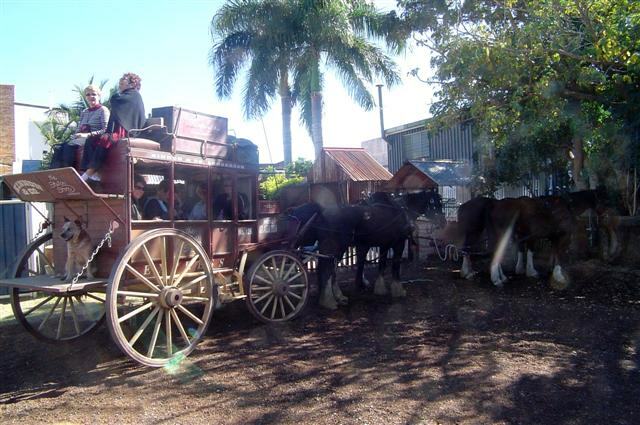 And to really experience the outback atmosphere you can take a gallop through the “scrub” aboard an authentic Cobb & Co coach. We rolled up for our ride on the coach a little before 9:00 and were presented with a typical morning tea or “smoko” as would have been done in the days when this was the only form of travel apart from walking. The tea, in teapots and not with teabags, was served in china teacups along with fresh scones and homemade raspberry jam with real, fresh whipped cream. It was delicious and thoroughly dripping with everything not good for you! Cobb & Co was really like this! Not long after we’d finished we boarded the coach for our ride.This particular coach has been faithfully restored, down to the minutest detail. About the only concession to the modern era were the headphones that we donned so that we could clearly hear our driver’s commentary. The coach was pulled by 4 beautiful horses, and yes, someone did comment that it was a 4hp vehicle, and our driver, Richard Kinnon, started off at a very sedate pace until we were out of the town proper before letting the horses run for our gallop through the bush on roads that could have come straight out of the 1920’s. Along the way we passed by an old, very old, Coolibah (eucalyptus) tree that had seen the likes of Banjo Patterson (1864-1941) and Henry Lawson (1867-1922) pass by and most likely was more than 200 years old. depicted on our Coat of Arms, denoting a country that is only moving forward. We galloped over the Commons which is common land where landowners can graze up to 4 head of cattle or sheep for no charge and it was at this point that we were introduced to our pole runner, Emma. The pole runner, known in America as riding shotgun, had the job of running along the pole in the rigging to pick up the reins if the driver should drop one so that the horses didn’t break their stride. Whether Richard dropped one on purpose or not, we’ll never know but Emma certainly showed that she knows her job. It’s not something I would ever do! Our ride ended with another sedate walk along the main street. In Australia horse-drawn vehicles have right-of-way on all roads. As Richard pointed out, they don’t have ABS brakes. start in the morning on the next leg of our adventure. It’s easy to get to Longreach; there’s the train, the Spirit of the Outback, that comes twice a week, Qantas has daily flights,, of course, coaches, from McCafferty’s not Cobb & Co, have daily services, and even though Longreach is almost 1200 kilometres (nearly 750 miles) from Brisbane, it is serviced by fully sealed highways, making a road trip a pleasure. 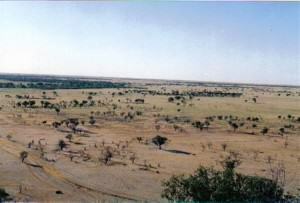 But however you get there, you will find a thriving outback community and a great big outback welcome. And when you return home you will want to come back again and again.